When plotted on a forecast map weather-data can look intimidating. Weather forecasting requires a number of different skills from several disciplines. We apply science and technology to determine the most likely state of the earth's atmosphere at any given place and time in the future. Want to quickly see meteorological quantities, which we call fields? Want to see them for the entire country at once and compare weather at different locations easily? A weather map makes this easy to do - to look at a presentation of huge amounts of data at a glance. It also allows you to quickly see patterns in the fields. Features that we call highs and lows, troughs and ridges. We also identify large areas of rainfall, warm, cold and sunny weather in an efficient manner. In a forecast map weather patterns show up as predicted for tomorrow or some other time in the future. And you can understand what is going to take place, especially if you compare forecast maps on a day-by-day basis. This is great for travelling. A meteorologist works with these these maps to make predictions, and you might wonder how. Here are a few notes I made after reading one of the operational meteorology training manuals. What to do before working with the official data for a dozen or so fields? How do we wade through these variables such as temperature, pressure etc. and recorded at perhaps a hundred or more surface locations such as airports? Meteorologists need some way to make sense of this information. Using the forecast map weather professionals provide important interpretations for large organizations. Employers such as the National Weather Service or equivalent agencies in other parts of the world. These government departments produce local weather forcasts and aviation weather forecasts. Broadcast corporations such as the Weather Channel, The Weather Network and AccuWeather can have their own staff meteorologists making customized public forecasts as well. They analyze and sort the information by contouring. That is drawing curves, called isopleths, on the map, joining places with equal values for each variable and using a standardized set of colors to represent each of the different types of quantity. They look for familiar patterns and compare their analyses with satellite photos and radar imagery to confirm or append their initial conclusion. By knowing the physics of the atmosphere, they can diagnose the weather situation and make a four-dimensional picture of the atmosphere. What does four dimensional mean? The usual three plus time. Meteorologists are good guessers. With their forecast map weather wizards have to make quick decisions using insufficient data and may even incorporate their knowledge of an area's history and known tendencies to fill in the gaps. Or even make a prediction contrary to what the raw data would suggest by itself. Teachers: How can you use forecast maps in the classroom? Perhaps you can find some general ideas in this section on atmosphere lesson plans or upper layers in our atmosphere and show pupils how we make maps for each of these upper altitudes. You’ll see more on higher elevations and their interactions with the atmosphere in the links below. Older students might be interested in an example of how a physics formula or two gets applied in a meteorological context. Does your curriculum allow for any internet-based topics such as website creation? Want to show them something really different? Really useful? You might find this information handy. For further details on wind creation, you can get information on weather jet streams and gulf streams from which you can make a comparison. 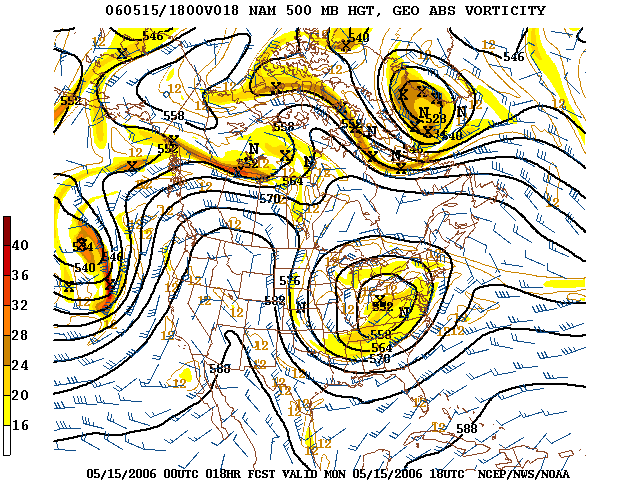 Also, check and see some of the vertical structure of the atmosphere. If it is rain storms, their creation and effects you're after, have a look at this dew point article or photos and diagrams of severe weather if you prefer. Finally, you can see forecast map weather techniques for analyzing patterns at higher altitudes in the troposphere; just go to the upper air analysis pages. Introduction to the weather maps that forecasters use to prepare your local weather forecast.